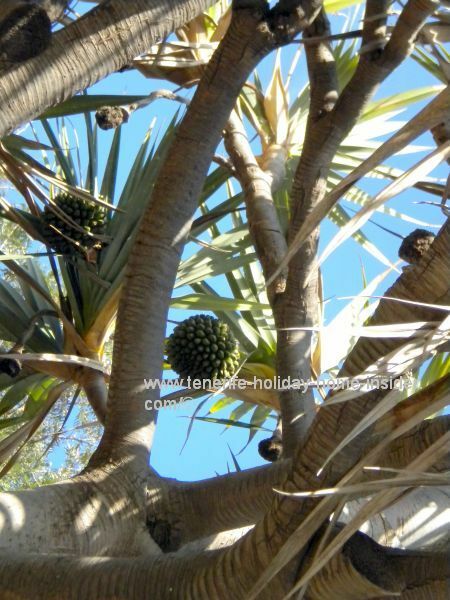 What best do with Tenerife bird seeds or palm seeds? Pandanus bird seeds, as they grow on the Pandanus or Pandan palm are quite big. Actually, they are not really palm seeds, Why? The pandan tree or so called Pandanus only looks like a palm tree. Anyway, its grains are very useful. Puzzled about this topic of such seeds? Why do I talk about them in my home page for Tenerife holiday homes? Why not? Use them to create some artwork and decorations for your holiday home in Tenerife. Collect them for free in the park of Playa Jardin Puerto de la Cruz. In fact, the Cuban restaurant over the road has a musical instrument which is decorated with such seeds. That yellow bird fruit of the Pandanus palm is a typical biology wonder. Also discover a green seed pod in the next picture of the palm like tree. This unripe pod looks like a smaller version of an immature pineapple or an oversize pine cone. The so called Pandan palm by the Maritim hotel fence is not a screw palm, although the latter belongs to the same family and would be a spiral Pandanus. For some reason I had mistaken it first for a Lala Palm. All types of Pandanus have air roots, as well as color, shape and size of 'palm leaves' as well as bird seeds. Pandan or Pandanus leaves are used for other arts and crafts besides the adornment of ethnic musical instruments. Marvel at the , yellow seeds beside. This photo adds to the Tenerife's wonders of nature, some of which are found very close to the Maritim Hotel Los Realejos. The photo shot was taken by the roadside opposite the Tenerife 'Beisball'(baseball) courts of Puerto Cruz Tenerife. 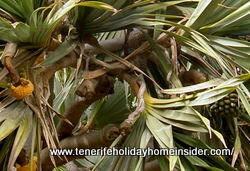 Many Tenerife villas have palms and other trees in their gardens with most remarkable seeds. Produce some handicrafts or art with them for your holiday home in Tenerife. 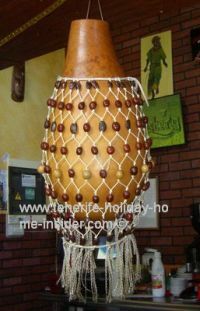 Caribbean musical instrument held by a bag made with seeds. Tree or palm seeds are so versatile. Of course, there are birds who eat them. They also fall on the ground. When its soil is sandy and when conditions are right, young trees and palms easily sprout from there. Indeed, the climatic conditions of Tenerife help seeds to germinate easy, as the humidity is often perfect. Where else find palm seeds and berries? Encounter a wealth of berries, tree and palm seeds of almost all sorts opposite the place with the most economic meal which is called Las Paraguitas by Playa Jardin. There, a genuine Caribbean pumpkin or butternut instrument stands on the counter. But, it doesn't only stand there idle. Also learn about the most amazing creatures which were two proper Canary birds that I discovered in the same neighborhood of the Pandanus plant by a most fantastic, subtropical park of the Maritim hotel of Puerto de la Cruz Spain. 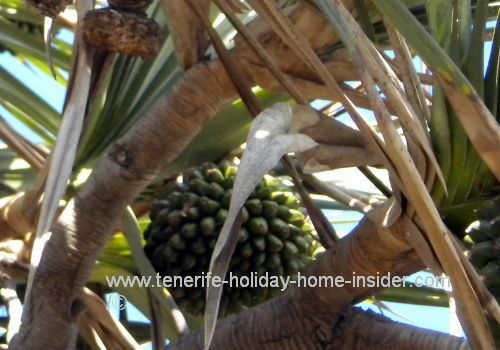 Click here to go to the Hotel Maritim Tenerife which has its own bird paradise with many palms with seeds..
From bird seeds back to Canary birds. What other seeds do birds feed on?